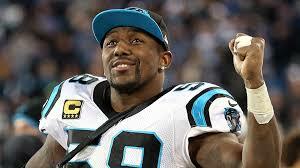 Thomas Davis is a 34 year-old linebacker who has been in the game for some time. Carolina Panthers recently announced that they would be extending Davis’s contract for one year through the 2018 season. This would have been Davis’s last season as he was entering the final year of his contract. Davis signed his previous contract in 2015 and had planned to play in Carolina for the entirety of his career. With his new contract, that dream may very well come true as it ensures that he will play with Panthers for the foreseeable future. Davis has had a whirlwind of a career. He has overcome three ACL injuries and even played through a broken arm during the Super Bowl in 2015. Davis recognised as one of the fastest sideline to sideline linebackers in the NFL. He goes in for tackles and has racked up at least 100 tackles each of the last five seasons. He also owns the franchise record with 1,086 career tackles in Carolina. Now that the Panthers have Davis’s deal set in stone, they will be turning their attentions to getting other players locked down, including Greg Olsen.